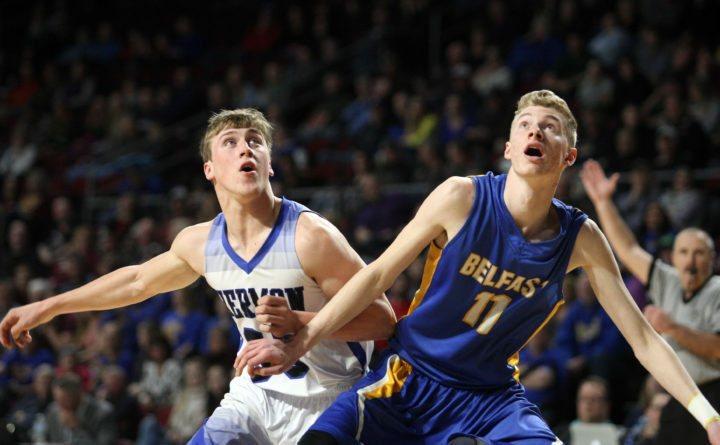 Hermon's Garrett Trask, left, and Belfast's Aaron Fuller look to the rim as they get ready to rebound during Saturday's Class B North quarterfinal. HAMPDEN, Maine — The Hermon High School football team made history Friday night, and the Hawks did it in style. Senior quarterback Garrett Trask and sophomore running back Zach Tubbs combined to rush for 311 yards and four touchdowns as second-seeded Hermon scored its first postseason victory in program history, overwhelming No. 7 Oceanside of Rockland 41-0 in a Class C North quarterfinal played at Hampden Academy. “This is a big win for our community, there’s a lot of support for us in Hermon,” said Hawks coach Kyle Gallant. “This is a big win for us, a big win for our kids. They put in the work over winter and over the summer to get to this point, and we’re not done yet. Trask rushed for 157 yards and two touchdowns on 18 carries while Tubbs — a fullback pressed into extra duty when starting halfback River Mullen suffered a second-quarter ankle injury — added 154 yards and two touchdowns on 19 rushes. Hermon earned a semifinal date next Friday against the winner of Saturday’s quarterfinal between No. 3 Winslow and No. 6 Waterville. Trask also completed 4 of 5 passes for 71 yards as Hermon generated 381 yards of total offense behind the line play of center Deakin Dow, guards Ian Facella and Kenyan Robinson and the brotherly tackle tandem of Adam McGuire and Alec McGuire. The effort wasn’t confined to offense, as Hermon’s defense limited Oceanside to 39 total yards just one week after the Hawks had eked out a 23-22 victory at Oceanside to close out the regular season. This also wasn’t merely the second meeting in as many weeks between these teams, but their second postseason clash in as many years after Oceanside upended Hermon 40-33 in last year’s quarterfinals. But this meeting did not have the same drama as its predecessors as Trask returned an interception for one touchdown and rushed for two more scores as Hermon raced to a 21-0 halftime lead and cruised to its eighth victory in nine games. Hermon drove from its 30 to the Oceanside 16 after taking the opening kickoff before the drive stalled after Oceanside’s Dylan O’Reilly sacked Trask for a 14-yard loss. It was a momentary setback for the Hermon standout who, two plays after Oceanside took possession, tipped a Mariners’ pass up in the air from his free safety position, collected the rebound and returned the interception 18 yards to give the Hawks a 6-0 lead with 5:27 left in the first period. “I took some read steps, and me and Tubbs switched and I saw the ball and went up for it and got lucky, I guess,” said Trask. Oceanside’s Zach Cody returned the ensuing kickoff 59 yards to the Hermon 31, but the Mariners were unable to capitalize on the field position and came up empty on a fourth-and-13 pass attempt. Trask then took the first-down snap after the change of possession and raced up the middle and then ran patiently down the left sideline 67 yards to the end zone to make it 14-0 with still 2:51 left in the opening quarter. “When you get outside around like that, sometimes I’ll hesitate a little bit to let the blockers get out in front of me and let them block and then just have one guy to beat,” he said. Trask added his third touchdown on Hermon’s next possession, capping off a 35-yard drive set up by a Keith Pomeroy’s 30-yard punt return with a 14-yard run around right end. That extended the Hawks’ advantage to 21-0 with 11:08 left before intermission. Hermon nearly scored again just before the break, as Tubbs rambled 28 yards to the Oceanside 1 in the final seconds before a pass by Trask went incomplete in the end zone as time expired. The Hawks added touchdowns on their first three possessions of the second half. Tubbs scored on third-quarter runs of 4 and 17 yards, the first one play after Pomeroy went up between two defenders to catch a 28-yard pass from Trask and the second after Trask passed to Jacob Bailey for 23 yards on a third-and-15 play from the Oceanside 40. Senior Sean Stark scored on a 1-yard run midway through the fourth quarter, and Kaleb Goodine capped off the scoring with his third extra-point kick.